The House At The Bell Apartments Cesky Krumlov is situated in a 17th century building only 200 meters from the heart of the city. The hotel is near a number of historical sites. There are many museums nearby as well as the castle. 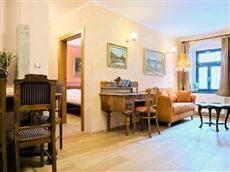 The House At The Bell Apartments Cesky Krumlov is located near the train and bus stations. These transit methods offer access to the Prague airport, with transit taking 3 hours by bus and 5 hours by train. Taxis also run through the area, though local attractions are easiest to reach when exploring by foot. All six of the apartments at the House At The Bell Apartments Cesky Krumlov offer a large kitchen. Apartments also offer private bathrooms. There is a studio apartment available on the ground floor for disabled guests. Guests of the House At The Bell Apartments Cesky Krumlov will find that the area offers a large number of shops, restaurants, and leisure activities. The hotel offers a total of six full apartments. There is also parking available for guests with rental cars.